Did you read about the 'Day of Freedom' demonstration in London on 6 May? No? Don't worry – very few other people did either. Or, perhaps you keep abreast of events in Germany, in which case did you read about the 'New Hambacher Fest' on 5 May? No? Ditto. Perhaps we ought to be grateful that the mainstream media barely report such events, if at all – it saves us from having to put up with their sly misreporting and their lazy prejudices. The silence is telling, because in general the media are desperate for stories to fill their pages. Even a sponsored review of hand-held food mixers will be gratefully taken up. That a meeting addressing some of the major political and social issues in modern life is ignored is not the result of 'busy talking about more important things' but self-censorship. In all the censorship systems known to the author the ultimate goal was not censorship itself but the establishment of self-censorship: once the censor has painfully wielded the scissors a few times, publishers get the idea and are forced to collaborate in order to keep their businesses going. The perfect censorship system is one where no censorship needs to take place. Certainly, no food processor has to fear the censor's marker. The Hambacher Schloss, near Neustadt in Rheinland-Pfalz, in south-west Germany. Image: Google Maps. The New Hambacher Fest is a perfect case in point. The original Hambacher Fest took place at the end of May in 1832. 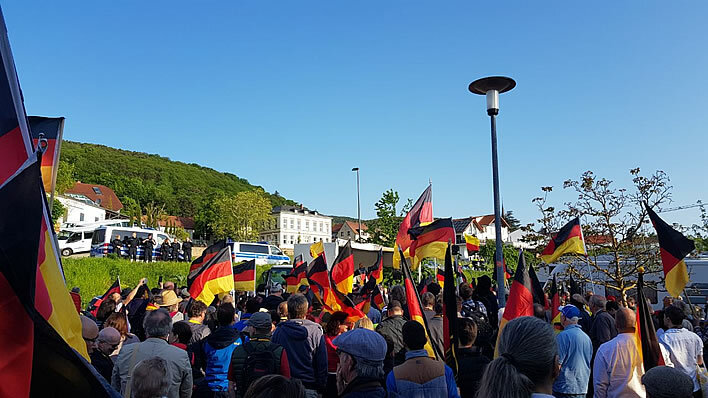 It was a protest by German citizens – 20-30,000 of them, from many walks of life – that took place at a time of coordinated repression and censorship in the patchwork quilt of states that made up the Deutscher Bund, the 'German Confederation'. German patriots wanted freedom from repression, an end to censorship and the re-stitching of the quilt into a single German nation. The Hambacher Fest marked the beginning of a period in German history known as the Vormärz, the 'Pre-March', sixteen years of subversive rumblings that culminated in the revolution of March 1848, hence the name. The great procession to the Hambacher Castle (then a ruin) from the assembly point in Neustadt. Image: E. Müller-Baden, 1832. In the decade before the Hambacher Fest and in the sixteen years until the revolution of 1848 the social, economic and political conditions combined into a perfect storm of misery for a broad swathe of the downtrodden. There was desperate hunger. There was an almost total collapse of cottage industries which led to a phenomenon the historians call daintily 'Pauperism' – meaning in less dainty language that entire families starved in hopeless misery, many of them to death. The worse things got, the more people complained, the more brutal the repression of all expressions of discontent became. The Hambacher Fest itself triggered one of these reactions: the two principal speakers at the event were arrested and brought to trial in the following year. Johann Richard Seel (1819–1875), Der Eintritt der Censur in Deutschland / Der deutsche Michel in der Gewalt der Zensur , 'The beginning of censorship in Germany' or 'The German Michel in the power of the censorship', 1842. Image: Deutsches Historisches Museum. In the centre, appropriately enough, we see the dainty figure of Prince Klemens Wenzel Lothar von Metternich (1773-1859), long-serving Austrian Foreign Minister, architect of the European order after the defeat of Napoleon and the Congress of Vienna in 1815. His career was dedicated to maintaining the feudal order in Europe, for which task no instrument of repression was too severe. His system of repression became known as the Metternich System. His closest advisor, Friedrich von Gentz (1764-1832), is depicted showing Metternich a heavily censored book with an image of Martin Luther. Von Gentz is dressed as a Jesuit. The female figure to the left of Gentz is a red-nosed allegory of censorship, bearing the instruments of censorship, a pair of scissors and a pen-kife/scraper. The large figure on his knees behind Metternich is the German Michel, the symbol of the German people (the German 'John Bull'). His mouth is sealed by a padlock. To his right we see the female embodiment of winged Germania. Cutting her wings is Ernst August I (1771-1851) Duke of Cumberland, Brunswick and later King of Hannover, who managed to become famous as an arch-reactionary both in Britain and Germany. Germania's ankles are being shackled, but by whom I have no idea. But the most insistent demand at the Hambacher Fest was not for economic reform but for political reform: the unification of Germany. The participants in the meeting, coming as they did from their own little bits of the patchwork quilt, felt – quite rightly, in fact – that the people, the governed, had no say in a political system that was directed by the Austrian Foreign Minister Prince Metternich, operating through the '34 potentates' who ran the individual patches. We read of the '34 potentates' again and again in the works of so many of the politically active writers of the time, Heinrich Heine included. The main demand of the Hambacher Fest was the demand for self-government and a full democratic say in that government. We discussed this movement for the unification of Germany in some depth in our piece on the anthem Deutschland, Deutschland über alles. A replay of the original Hambacher Fest was organized by the finance expert and economics Professor Max Otte from Cologne: the New Hambacher Fest. 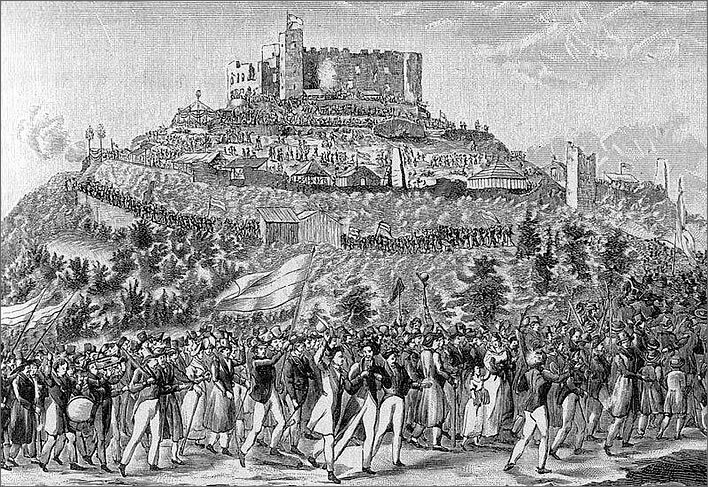 The ticket-only event attracted something like twelve hundred participants (as usual, the count is in dispute), who assembled in a parking lot in nearby Neustadt and walked up to Hambach castle, just as the participants had done in 1832. Top: assembly in the car park; middle: the march up to the castle; bottom: the last ascent. Images: PI-News. There was food, music and speeches – all the indispensable ingredients of German politics – and even the weather god smiled benignly down on them. The speeches – just as in the original Fest – were all in praise of freedom, patriotism and against the modern forms of censorship. One speaker actually read a long excerpt from one of the speeches from the 1832 Fest. German politics the easy way. Image: PI-News. The principal echo of the first Hambacher Fest was the demand for the political repatriation of Germany to the German people. Much like the Brexit voters in the UK, many Germans feel that the EU has turned them into political pawns. The German word Bür­ger­nä­he, 'nearness to the citzen' expresses the requirement elegantly, but just inventing a word for the condition does not bring it about. Their own government is a conspirator in the process of distancing itself from the citizen. They feel powerless to counter remote decisions made without them by an increasingly unaccountable political class which, just to rub it all in, mocks and demeans them. Götz Kubitschek's speech to the demonstration in Cottbus on 24 February this year expressed this nexus of frustrations well. 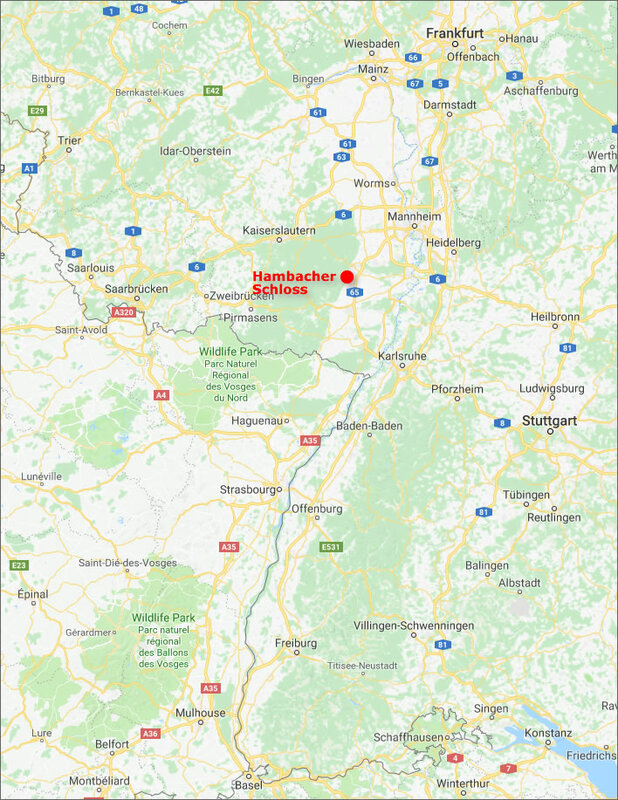 A remarkable fact is that the speakers at the New Hambacher Fest were politically ecumenical: some were still members of the CDU (the ruling bourgois party), the SPD (the socialist party), the FDP (the liberal party – that is, 'liberal' in the old sense) and of course the AfD (the new patriotic party). However, apart from the AfD, no office holders from the other parties were present – their invitations had all been declined. The speakers were all dressed formally and came from the educated classes in Germany. Of course the disruptive 'AntiFa' movement – let's not dignify them by calling them left-wing – tried their best to cause trouble but failed miserably. 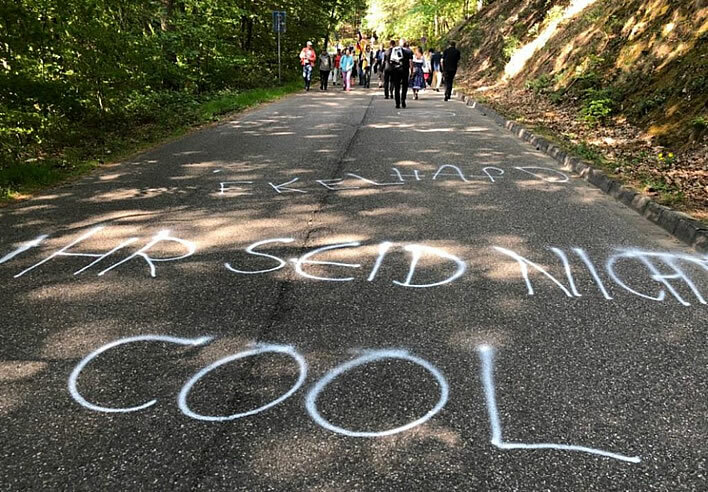 In fact, the illiteracy and errors in the slogans they had sprayed on the approach road gave the participants who walked over them cause for hilarity: if there is one things that educated Germans take seriously it is grammar and spelling. 'Ekelhafd' (recte ekelhaft, 'disgusting'). We assume most participants could take being told that 'You are not cool' in their stride. Image: PI-News. All in all a cheering, peaceful, even heartlifting demonstration for democracy, patriotism and an end to censorship – well, we all want that, don't we? Apart from reports on the websites of the usual suspects there was very little written in the mainstream German media. The only account in a major newspaper that I found was in what used to be the German 'newspaper of record', the Frankfurter Allgemeine. Their reporter Justus Bender had either not bothered to get himself an invitation and so could give no report of the speeches and the events in the castle, or, shamefully, deliberately chose not to report any of this. Bender went to some trouble to invent a political Venn diagram that aligned the participants under the label 'right-wing', despite the diversity of their political origins. He also concentrated his reporting on the few protestors who turned up and their opinions of the event, giving them extended coverage. He concluded that, whereas the participants at the Hambacher Fest in 1832 had to fear repression, the same could not be said for those on either side of the fence. 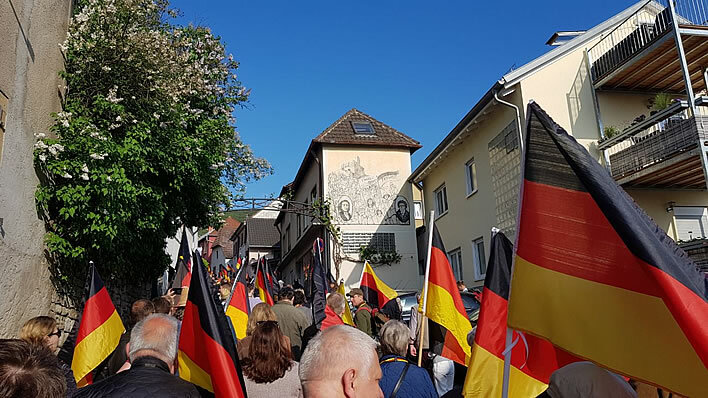 As far as television is concerned, the ARD, the principal state TV channel in Germany, would have been remiss if it had not produced an account of the event, but the one it produced was only broadcast on SWR, its regional news channel for Rheinland-Pfalz, where Neustadt/Hambach is located. On its website the ARD also offered us a contribution on the theme from those mad lefties at Deutschlandfunk, a two minute piece wondering whether history had been 'kidnapped by Neurechten, 'neo-right-wingers'. A demonstrator who favoured 'open societies' told us how undemocratic the Fest participants were. We are first told that Hambacher Castle was the 'cradle of and memorial to liberal democracy', but was now being used this weekend as the backdrop for a rechts-nationalen Schulterschluss, 'right-wing-nationalists closing ranks'. The participants were united in their feelings of 'victim status' and up to now had only met discreetly. We then heard more about these Hambacher monsters from an 'Extremism Researcher', who told us that they were trying to form alliances with moderate politicians – thus hinting at the events during the Nazi seizure of power in Germany in 1933. Straining to provide some analysis, the editors of the piece use the event as a hook upon which to hang an astonishing conspiracy theory that is retailed to us with a completely straight face: the [AfD]/[neo-right-wing]/[some other shady people] were trying to bring together a consensus of right-wing intellectuals for some unspecified purpose – presumably a second Nazi takeover. We were left wondering why intellectuals by definition had to be left-wing. Introduced by a clip consciously reminiscent of Hitler inciting his audience to chant slogans, the report then questioned Matthias Matussek, one-time Spiegel Culture Editor, on how he coped with the belly-ache he got from such proximity to the likes of the AfD? He in return took no prisoners, pointing out that he had no belly-ache at all. Indeed, he found the emergence of the AfD an 'unbelievably refreshing' event. In order to neutralise Matussek, a lady came on to tell us that 'authoritarian thinking' was now considered 'chic', trendy in some quarters. The day after the event, the regional station SWR gave these right-wing thugs another whack for good measure. The 'controversial' event had 'divided opinion' and had been initiated by 'national-konservativen Kräften', 'national conservative forces'. SWR was happy to interview a compliant historian. Otte and the various speakers from the rechtspopulistischen Lager, 'right-wing-populist camp' missbrauchten das historische Fest für ihre politischen Ziele, 'misused the historic Fest for their political aims'. 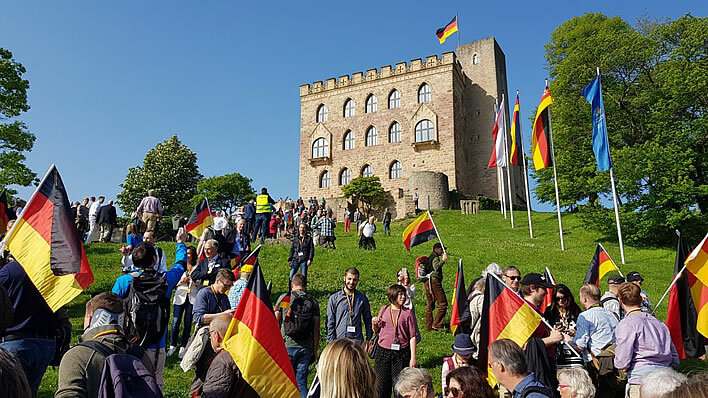 Many of the demonstrators found the presence of the rechtspopulistische, 'right-wing-populist' AfD at the castle particularly reprehensible – a revelation that does not surprise. Fortunately a large number of police were present to prevent a 'clash' between the participants and the counter-demonstrators. For the best, fairest and most thoughtful MSM account of the Hambacher Fest we have to go to Marc Felix Serrao in the Swiss Neue Zürcher Zeitung. He accompanied the walkers up to the castle, experienced the meeting and its speeches and wrote a balanced and completely fair review of the event. In other words he did exactly what good reporters are expected to do. If there is a place in Germany for political argument, then it is Hambach Castle. Sooner or later the bigwigs of the other parties in German politics are going to have to recognise this too. So that, if you happen to read the NZZ you will be well informed by a fair and thoughtful account of the event; if you read the FAZ you will imagine the Fest to have been a propaganda event for right-wing nutjobs; if you watch a politics programme on German TV you may now believe that some 'shady' intellectuals are building a conspiracy aimed at the overthrow of the state (it used to be the Jews – where are they when you need them? ); if you read any other mainstream German outlet, you won't even know that this meeting took place. Choose your censorship. Serrao's key point, that the New Hambacher Fest exposed the deep divisions in German politics, is also perceptive and completely valid: one merely has to review the nature of the treatment of the event by mainstream politicians and mainstream media to see the huge seismic fracture that has opened up in the last few decades. No discourse appears to be taking place across this divide. Fortunately, unlike 1832, these days we have the internet. We have a wide range of opinion of all flavours. We also have videos that mean we can form our own opinion. The censors are now busy on social media and large websites trying to ensure conformity, just as they did under Metternich. It's not so easy for them these days, though. 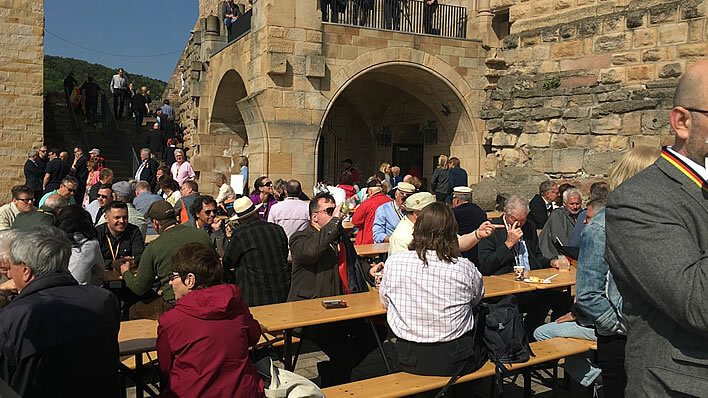 We can watch nice, cheerful people who dragged themselves out of their comfortable beds early on a Saturday morning to get themselves to Hambach Castle at eight o'clock and participate in an enjoyable party of patriotism. We can watch relaxed police officers enjoying the atmosphere without needing to dodge the spit, the firecrackers, the urine bombs and the vulgarities they get from the other side. If this is what a conspiracy of intellectuals looks like, let's have more of it. As Serrao said: the perfect place for political discourse. The powers-that-be tell us that the right-wing forces of darkness must not be allowed to instrumentalise the Hambacher Fest for their own evil purposes of freedom of speech and freedom from censorship. Somehow, though, it is considered fitting to erect a statue to Karl Marx not far up the road in Trier, a present from the lovely Chinese Republic, that model of free speech. A video review of the New Hambacher Fest is now available on YouTube. It's 42 minutes long and all in German, but even if you don't understand German you can skip around and get some impressions of these deluded, conspiratorial, right-wing-nationalist thugs plotting the overthrow of civilisation as we know it. For the curious, the individual speeches are also available at the YouTube link above. The single unpleasant incident of the entire day was the farmer who sprayed liquid manure across the road and then with a hosepipe gave a few of the marchers a wetting – before the police arrived and curbed his enthusiasm. We on this website say again and again that in German politics, nothing ever really changes. Watching videos like this does give a glimmer of hope, however.